You can view the Shakespeare quartos on this site separately or you can compare any two copies. It also includes different versions of the same plays. A written description about playhouses including a description of each of the famous playhouses in Shakespearean times. The term "players" are now more commonly known as "actors". Here is a written description about the Company of Players and a description of each of the famous companies in Shakespearean times. A description of "actors" in general and specific famous actors in Shakespearean times. Sam Wannamaker's Dream: A Globe Theatre (05:44) - Thanks to visionary Sam Wanamaker, the reconstruction of the Globe Theatre in London allows visitors to become a part of Shakespeare's world. 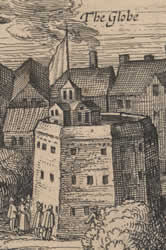 Architects and builders used the materials and crafts of Shakespeare's day in building the theater. Shakespeare's Globe: A Tour With Mark Rylance (05:04) - On a tour of the theater, Mark Rylance, artistic director, notes the structure's craftsmanship. The Elizabethan four frames of existence, physical, psychological, spiritual, and the divine, are represented by the four levels in the theater. Performances at the Globe Theatre (03:52) - Actor James Garnon arrives at the Globe to rehearse a sword fight scene before the evening's performance of "Romeo and Juliet." Globe Education: Lively Action (03:41) - The Globe offers experiences for college students to work with masters of voice and acting. Globe instructors use the rhythm and meter of Shakespeare's language to engage disabled students. The Globe also produces plays by Shakespeare's contemporaries. Three A's: Architecture, Acting, and Audience (04:41) - The Globe's permanent exhibition puts the theater in its historical context. It also engages the public in different ways, including Shakespeare karaoke. Guides help visitors see the connection between the architecture, acting, and the Elizabethan audience. Music at the Globe Theatre (03:44) - Music to Shakespeare operated between the realm of men and the gods, so the musicians' gallery is placed above the stage. The wood and plaster of the structure creates near perfect acoustics for the period instruments to tell their own stories. Costumes at the Globe Theatre (05:50) - Actor James Garnon scopes out the audience before the production. 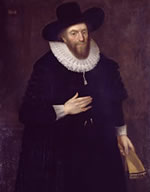 All the Globe's costumes, such as shoes, ruffs, doublets, dresses, and britches, are made in-house, using the same methods and materials of Shakespeare's time. Relationships Between Actors and Audience at the Globe Theatre (07:47) - Period music and clothing and the close space between audience and actor help the actors connect with the audience and vice versa. The natural lighting allows actors to use their instincts and the audience to observe the entire stage at once. Success of the Globe Theatre (04:26) - The audience's loyalty plays a powerful role in fulfilling Sam Wanamaker's dream. The theater has successfully transformed the area around the theater. 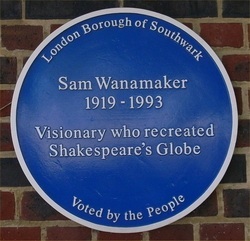 Unfortunately, Wanamaker did not live to see his Globe built. Take a virtual tour of the Globe Theatre. See panoramic images of the stage, yard, middle and upper galleries. A virtual tour of Shakespeare's Globe Theatre with historical descriptions. The Globe Theatre in London is famous as the site where many of Shakespeare's plays were (and are) performed. Learn more about this landmark in a short video, and visit www.folger.edu/london to explore life in London during the 16th and 17th centuries. Behind the genius that has given the works of Shakespeare their preeminent position in the literature of the English language is the Renaissance world of Elizabethan England. Scenes from Shakespeare's plays illuminate the theater for which he wrote, while archival paints reveal changes in society that influenced his selection of sources, settings and themes. As we follow the evolution of his career as actor, playwright and theater shareholder through the reigns of Elizabeth I and James I, we discover the values that give their timeless appeal. A description of Globe Theatre female roles, The women's costumes and make-up, Character recognition, and The Masque and Class differences. Sword figthing... how to practise? Just like ballet.... steps moves rehearsed. Chris, Sara and others do their best. Getting into Drama School: Tips on Acting Shakespeare? Just a couple of tips on acting Shakespeare from different things and personal experience. He mentions SparksNotes. 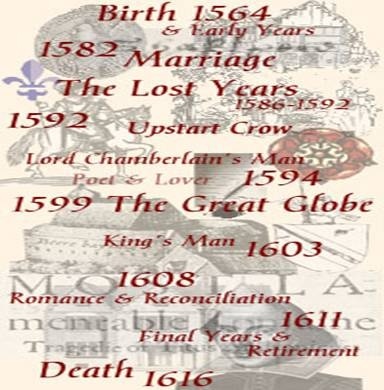 Click here for links to Shakespeare SparksNotes. Kim F. Hall, professor of English at Barnard College, on how Shakespeare's time helps us think through war, religion, race, and other issues in our own time. From the Folger Institute's 2011 NEH summer institute, Shakespeare: From the Globe to the Global, directed by Michael Neill. Click below for a Google Books online version of Shakespeare's Theater by Ashley Horace Thorndike. It was published by The Macmillan company in 1916 and is 472 pages. To the right is the table of contents for this book. An online activity to learn about Shakespearean plays by picking a part in a play, learning about the character, learn background information for the part, learn about the play, and your role in it. 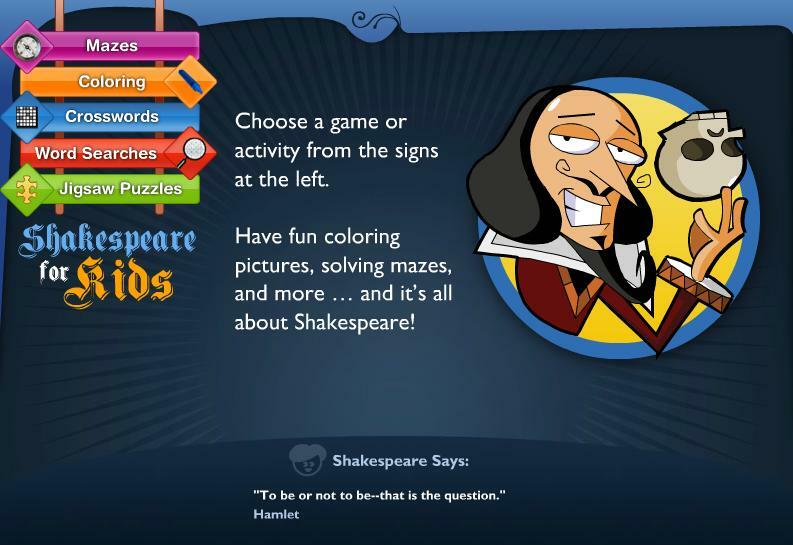 This site has fun facts and activities on Shakespeare for kids. It includes a link to meet the people who work at the Folger such as a costume designer, curator, librarian, play director, and director. 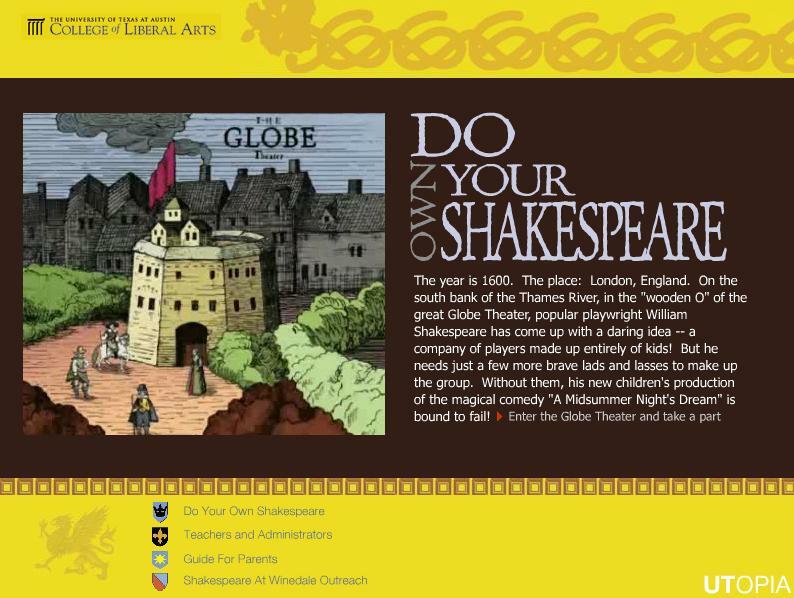 This site has online activities on Shakespeare for the younger set. It includes mazes, coloring pages, crosswords, word searches, and jigsaw puzzles. A Lecture on Elizabethan Theatre by Thomas Larque.